"Hey! There's bird crap on my tie!" 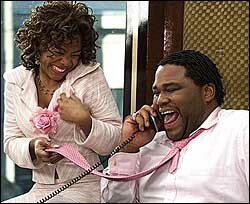 Malcolm King (Anthony Anderson) is a filthy rich, conceited CEO on the eve of a divorce from his wife (Kellita Smith, "The Bernie Mac Show") that will cost him millions. Looking to prevent any loss of his beloved wealth, he enlists his dimwitted mistress Peaches (Regina Hall, "Scary Movie") into arranging a mock kidnapping to force his wife into hasty legal decisions. Unfortunately for Malcolm, many associates in his life have the same plans. The arrogant businessman eventually ends up in the home of Corey (Jay Mohr), a loser who's in way over his head. Rotund, all-mouth comedian Anthony Anderson has stumbled upon a small morsel of fame playing sidekicks in "Kangaroo Jack" and "Barbershop." How this happened, I can never explain. Anderson's aggressive comedic skills leave a lot to be desired, and they're amplified horrifically when the actor decides he'll improv his way through a scene. Watching Anderson try to be funny is like getting a tooth pulled, or sitting through a Tim Burton DVD audio commentary. So what to make of "King's Ransom" (IMDb listing), a film where Anderson is the star of the production? You don't have to shake a magic 8-ball to see where this is headed. Straight-to-video maestro Jeff Byrd makes his big screen directorial debut with "Ransom," and I'll give the filmmaker this, his picture isn't boring. Byrd keeps the pace snappy as he plows through his checklist of thug life urban cliches (gold teeth, car fetishes, deeply sexualized women), flatulence jokes, and Anderson's train whistle delivery. Byrd keeps his film on target, though what he's battling to maintain really isn't something to be proud of. There's nothing in "Ransom" that hasn't already been covered in countless other urban films, including the slapstick humiliation of caucasians and the monotone thumpity-thump-thump-thump hip-hop soundtrack. "Ransom" doesn't want to challenge the genre in the least, instead it imagines itself a comedic farce, which it could've become if not for Anderson's shrill, lazy performance. The only comic inspiration that seems to work in "Ransom" comes from Donald Faison ("Scrubs") and Charlie Murphy as two fringe players in the outrageous Malcolm King kidnap game. While playing his umpteenth convict character, it's hard to deny Murphy's hilarious newfound sense of comic timing due to his stellar work on "Chappelle's Show." Matching him well is Faison, who delights in playing up the fear (both sexual and physical) his character has of Murphy. They make an amusing team, and "Ransom" rockets up in interest when these two are onscreen. Sadly, Byrd doesn't seem to feel the same way, and he only sporadically cuts back to their subplot. "King's Ransom" might fly by in a blur, but it still reeks of low quality. While I'm sure there will come a day when Anthony Anderson is ready to carry his own film, after sitting through this one, I hope it doesn't come anytime soon.